The Supreme Court of the United States issued a decision this week, holding automobile dealership service advisors are once again exempt under the federal Fair Labor Standards Act (“FLSA”). In what Yogi Berra might describe as a case of “déjà vu all over again,” the Supreme Court again overruled the Court of Appeals for the Ninth Circuit, which had issued a 2017 decision that dealership service advisors are not exempt from overtime requirements under the FLSA. As you may recall, the Ninth Circuit Court’s 2015 ruling, which reached the same conclusion as its 2017 decision, was also reversed by the Supreme Court in a June 20, 2016 decision that sent the case back to the Ninth Circuit and, ultimately set the stage for the 2017 decision of the Ninth Circuit and this latest Supreme Court decision. This protracted legal back-and-forth revolves around an interpretation of whether the U.S. Congress intended service advisors to be included within the FLSA’s exemption for certain automobile dealership positions and the weight that courts should give to the U.S. Department of Labor’s historical interpretation that service advisors were exempt. Specifically, the FLSA expressly exempts certain dealership employees from the requirement to pay overtime (1.5 times the hourly rate for hours worked over 40). This exemption applies to, “any salesman, partsman, or mechanic primarily engaged in selling or servicing automobiles, trucks, or farm implements, if he is employed by a nonmanufacturing establishment primarily engaged in the business of selling such vehicles or implements to ultimate purchasers.” 29 U.S.C. § 213(b)(10) (2016). From 1978 to 2011, the U.S. Department of Labor interpreted this exemption to apply to dealership service advisors (as salesman of services), however, in 2011, the Department reversed course and issued a new rule that applied the exemption only to “salesman”, meaning service advisors would have to be paid overtime. 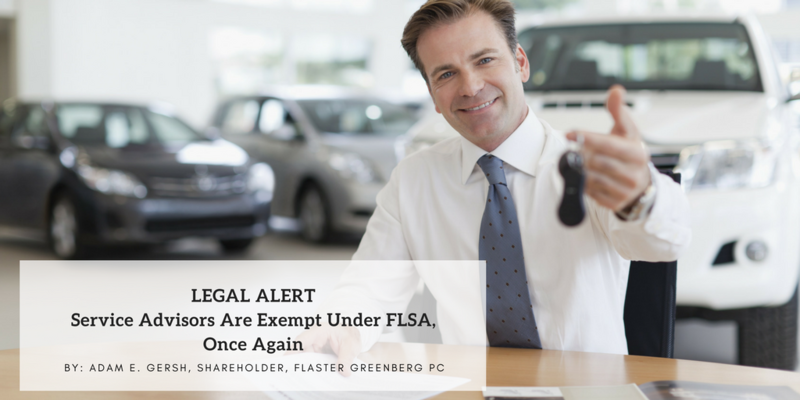 While this dispute has taught us to never say never when it comes to the Ninth Circuit’s interpretations of the FLSA, for the time being, it appears that the issue is now settled and that dealers may treat their service advisors as exempt employees again. To learn more about best practices for complying with the FLSA or to address other labor and employment issues, we invite you to contact Adam E. Gersh, or any member of Flaster Greenberg’s Labor & Employment Practice Group.